Term used to describe an energy market in which the anticipated value of the spot price in the future is lower than the current spot price. When a market is in backwardation, market participants expect the spot price to go down. The reverse situation is described as contango. The market run by NGC using the Bids and Offers received to determine the most economic way to balance the system. The smallest trading block in the electricity generation and supply system that can operate independently and for which only one party is responsible. The means by which the transmission system operator recovers elements of the costs of running the transmission system. National Grid recovers the costs of balancing the System through BSUoS charges. The Statement of the Use of System Charging Methodology includes a detailed methodology for the calculation of daily BSUoS charges, some worked examples, and information on timing of BSUoS Charges and financial settlement. A factor that may restrict a firm‘s entry into a market. A product which provides for the delivery of a flat rate of electricity in each hourly period over the period of the contract. Where market conditions suggest that prices are likely to fall. Bid-offer spread shows the difference between the price quoted for an immediate sale (bid) and an immediate purchase (offer) of the same product; it is often used as a measure of liquidity. An indication of a willingness to reduce (bid) or increase (offer) the level of generation or increase (bid) or reduce (offer) the level of demand submitted to the balancing mechanism. The name collectively given to the six companies that supply most of the energy to domestic households in the GB market. They are Centrica, E.ON, Scottish and Southern Energy, RWE Npower, EDF and Scottish Power. Refers to two parties. Normally used in connection with trading whereby two parties (for example a generator and a supplier) enter into a contract to deliver electricity at an agreed time and price in the future. An arrangement to provide credit agreed directly between two counterparties, rather than through an exchange or clearing house. A form of bilateral contract between NGC and a licence-exempt distributed generator. Balance of Month - relates to gas or electricity for delivery in the remainder of the current calendar month. The commercial and practical arrangements for trading and balancing which apply to the whole of Great Britain from April 2005. A building energy management system (BEMS) is a sophisticated method to monitor and control the building's energy needs. Next to energy management, the system can control and monitor a large variety of other aspects of the building regardless of whether it is residential or commercial. Examples of these functions are heating, ventilation and air conditioning (HVAC), lighting or security measures. BEMS technology can be applied in both residential and commercial buildings. Where market conditions suggest that prices are likely to rise. The payments made by suppliers who did not submit sufficient Rocs to meet their targets for Renewable Obligation. An option that gives the buyer (holder) the right, but not the obligation, to buy a futures contract (enter into a long futures position) or physical commodity for a specified price within a specified period of time in exchange for a one-time premium payment. It obligates the seller (writer) of the option to sell the underlying futures contract (enter into a short futures position) or commodity at the designated price, should the option be exercised at that price. A capacity mechanism explicitly rewards the provision of capacity. Proposals for a capacity mechanism were part of the Government‟s Electricity Market Reform (EMR) consultation document, and the July 2011 publication of the EMR White Paper confirmed that a capacity mechanism would be implemented. The Carbon Reduction Commitment (CRC) is an innovative climate change and energy saving scheme for the UK. It will encourage improvements in energy efficiency which can save organisations money. The scheme has been designed to generate a shift in awareness in large organisations especially at senior level, and to drive changes in behaviour and infrastructure. Arrangements whereby generators and suppliers pay or are paid for imbalances i.e. shortages and surpluses of power relative to their contracted commitments. Contract for Differences - A contract designed to make a profit or avoid a loss by reference to movements in the price of an underlying item. The underlying item is not bought or sold itself. Current customer has moved away and new occupier is present at the supply point. Churn is typically measured as the volume traded as a multiple of the underlying consumption or production level of a commodity. The generating margin for Gas and Coal Fired electricity plant after the cost of EU-ETS carbon allowances has been removed. The process by which a central organisation acts as an intermediary and assumes the role of a buyer and seller for transactions in order to reconcile orders between transacting parties. An organisation which guarantees the performance and settlement of futures and options contracts, e.g. the London Clearing House in London or the Options Clearing Corporation in Chicago. A tax on the supply of electricity and gas collected by Suppliers from business consumers. The size (usually in MW) of the contract to be traded. An obligation or security linked to another obligation or security to secure its performance. Simultaneous generation of usable heat and electrical power in a single process. A generating facility that produces electricity and another form of useful thermal energy (such as heat or steam) used for industrial, commercial, heating or cooling purposes. A futures contract on a commodity. Unlike financial futures, the prices of commodity futures are determined by supply and demand rather than the cost-of-carry. Commodity futures can, therefore, either be in contango (where futures prices are higher than spot prices) or backwardation (where futures are lower than spot prices). Commodity swaps enable both producers and consumers to hedge commodity prices. The consumer is usually a fixed payer and the producer a floating payer. If the floating-rate price of the commodity is higher than the fixed price, the difference is paid by the floating payer, and vice versa. Usually only the payment streams, not the principal, are exchanged, although physical delivery is becoming increasingly common. Swaps are sometimes done to hedge risks that cannot readily be hedged with futures contracts. This could be a geographical or quality basis risk, or it could arise from the maturity of a transaction. The status achieved by a Participant when all requirements of this TA Change Compliance script have been satisfied. Generators will generally have a target energy output for any given time period, but not all will achieve this exact figure. Some will over-produce and some will fail to meet their target. Consolidation combines the partial or total outputs of a number of generators into one energy account so over- and under-producing accounts are combined to cancel each other out, resulting in a stable aggregate output. Consolidation can be particularly attractive for generation sources that are less less predictable than conventional generation, such as wind generation. Consolidation works best when the causes of the variation in generation output are not related. For example a wind farms in the same region are likely to experience peaks and troughs in output at around the same time and so consolidation is more likely to magnified variations in output rather than smooth them out. By contrast, combining a wind generator, a combined heat and power plant and a biomass plant is likely to bring a more stable output. Under BETTA, generators and suppliers of electricity are incentivised to balance their physical and contractual positions. Under this incentive generators who produce more electricity than they are contracted to supply are paid for "spilling" the surplus electricity onto the grid. Likewise, generators who fail to supply the contracted amount of electricity must pay for this shortfall. Generators who spill are paid a price for this excess that is generally lower than they would get in the open market. Those who have a shortfall have to pay a price that is generally higher than it would normally cost in the open market. Almost all smaller generators have contracts to consolidate their output, many with major generators or suppliers. These contracts generally include elements of embedded benefit and energy price and are not always explicit about how much benefit is specifically attributed to consolidation. Independent consolidators (those who do not own generation assets or demand) can offer the consolidation service by combining many smaller generators' output and specialising in value-added products. A party that buys the output of a number of generators and trades it in the wholesale market. Term used to describe an energy market in which the anticipated value of the spot price in the future is higher than the current spot price. When a market is in contango, market participants expect the spot price to go up. The reverse situation is described as backwardation. A contract notification details the volume of any energy bought and sold between participants. A single agent acts on behalf of both trading parties, and submits a single contract notification prior to gate closure. Parties must notify their contracted position to the System Operator for each settlement period through the process of Contract Notification. A long contracted position indicates that a party has contracted more supply than demand and a short contracted position vice versa. Any difference between a participants contracted position and its metered position will result in that party being out of balance. A measure to the degree to which changes in two variables are related. Correlation ranges between plus one (perfect correlation - the same amount of movements in the same direction) and minus one (perfect negative correlation - the same amount of movement in opposite directions). Like volatility, it can be calculated from historical data, but such calculations are not necessarily good predictors of behaviour. Correlation is also important for the pricing of some options, particularly those offering exposure to more than one market variable. The payout of a spread option or a yield curve option is based on the correlation between two underlying markets separated by space, tie or assets, while that of a quanto product will depend on the extent of the relationship between movements in the underlying and movements in the exchange rate. Conventionally the parties to a trading agreement are called counterparties. This term is used rather than buyer/ seller as the buying/ selling roles sometimes reverse in trading. The risk that a counterparty to a contract defaults and does not fulfil obligations. A type of commodity-product spread involving the purchase of crude oil futures and the sale of gasoline and heating oil futures. Each BM Unit has a Credit Assessment Load Factor (CALF) value, which is a measure of their average generation/demand as a ratio of their maximum for the current BSC Season. These values are calculated seasonally for each BM Unit, and each Season’s values are published at the beginning of the preceding Season. CALF is used in the Energy Indebtedness calculation along with Generation or Demand Capacity (GC/DC) until II data is available. An exception is for Interconnector BM Units and those Generation Units with Credit Qualifying status who instead use Physical Notifications during this period. Credit risk, or default risk, is the risk that a financial loss will be incurred if counterparty to a (derivatives) transaction does not fulfil its financial obligations in a timely manner. It is therefore a function of the following: the value of the position exposed to default (the credit or credit risk exposure); the proportion of this value that would be recovered in the event of a default; and the probability of default. Credit risk is also used loosely to mean the probability of default, regardless of the value that stands to be lost. A time-series of prices for near to longer-term products. Fund Administration Agent - BSC Agent for Funds Administration in accordance with Section E1.2.4 of the BSC. Relates to the portion of the forward curve starting at the beginning of the front season. Whenever a contract‘s value at maturity is settled with a monetary transaction. A projection of the future price of a commodity or financial instrument over time, usually based on actual transactions. Gas or electricity for delivery in the first calendar month that occurs in the future. Also known as Prompt Month. Gas or electricity for delivery in the first calendar quarter that occurs in the future. Also known as Prompt Quarter. Gas or electricity for delivery in the first calendar season that occurs in the future. Also known as Prompt Season. An exchange-traded supply contract between a buyer and a seller, whereby the buyer is obligated to take delivery of a fixed amount of a commodity at a predetermined price at a specified location. Futures contracts are traded exclusively on regulated exchanges are settled daily based on their current value in the market. A standard unit of electricity power equal to 1000 watts, or to the energy consumption at a rate of 1000 joules per second. A unit of energy. A typical home uses around 3,300 kWh of electricity. A document issued by a financial institution, used in place in place of cash as collateral in particular where one of the counterparties have a weaker credit standing. Issued by Defra to "good quality" CHP to enable electricity to be supplied exempt from the Climate Change Levy. •Losses on the low voltage Distribution Networks are allocated through the use of Line Loss Factors (LLFs). •Losses on the high voltage Transmission System are allocated across BSC Parties through the use of Transmission Loss Multipliers (TLMs). 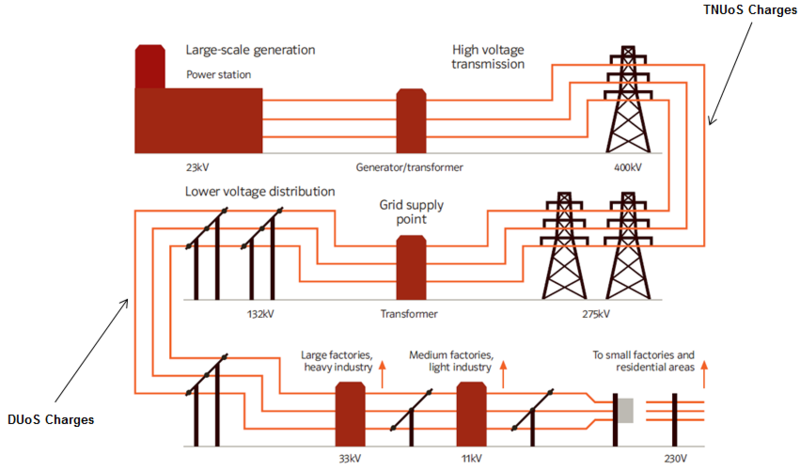 Line Loss Factors (LLFs) are multipliers which are used to scale energy consumed or generated in order to account for losses on the UK’s Distribution Networks. There are two types of Line Loss Factor: Central Volume Allocation (CVA) LLFs and Supplier Volume Allocation (SVA) LLFs. A market characterised by the ability to buy and sell with relative ease. Liquidity is the ability to quickly buy or sell a product without causing a significant change in its price and without incurring significant transaction costs. The Load Factor is the ratio of the average load to peak load. Load Factor is a measure of how variable a customer’s consumption is. A customer with a continuous demand at the same level will have a high load factor. A customer whose demand is generally very low but with large short duration peaks will have a low load factor. Letter of Credit (LoC) - A document issued by a financial institution, used in place in place of cash as collateral in particular where one of the counterparties have a weaker credit standing. The London Energy Brokers' Association (LEBA) was formed in 2003 in affiliation with the Wholesale Markets Brokers' Association to represent wholesale markets broking firms active in the Over the Counter (OTC) and exchange traded UK and liberalised European energy markets. One of LEBA’s principle activities is the collection, validation and distribution of a rapidly growing set of aggregated transaction indexes and benchmark forward curves. These currently cover gas, power, coal and carbon, and have gained rapid industry acceptance due to a consistent methodology and their verifiable underlying transactions. Energy monitoring and targeting (M&T) is an energy efficiency technique based on the standard management axiom stating that “you cannot manage what you cannot measure”. M&T techniques provide energy managers with feedback on operating practices, results of energy management projects, and guidance on the level of energy use that is expected in a certain period. To mark-to-market is to calculate the value of a financial instrument (or portfolio of such instruments) at current market rates or prices of the underlying. Marking-to-market on a daily (or more frequent) basis is often recommended in risk management guidelines. A party that provides the relevant meter asset. The general term describing the system buy, system sell prices under BETTA and the buy price under the renewables obligation. Market coupling is a method for integrating electricity markets in different areas, applied across a number of European countries. Market Domain Data is the central repository of reference data used by Suppliers, Supplier Agents and Licensed Distribution System Operators (LDSOs) in the retail electricity market. It is essential to the operation of Supplier Volume Allocation (SVA) Trading Arrangements. MDD is produced by the Supplier Volume Allocation Agent (SVAA) in the form of Data Transfer Network (DTN) flows D0269 (Market Domain Data Complete Set) and D0270 (Market Domain Data Incremental Set). A unique role identifier published by ISRA and/or SVAA which identifies a person by role and name and which can only exist on one gateway at any one time. Factors that principally drive the market sentiment, i.e. demand, costs, outages, power stack, etc. The Market Index Price (MIP) is used to set the reverse Energy Imbalance Price. It is calculated based on short term trading activity on exchanges. Currently the MIP is set based on selected trades undertaken on the APX and N2EX exchanges over a period of 20 hours before gate closure. An organisation that is currently approved for operation in the Trading Arrangements. The overall agreement which has to be signed by participants who wish to supply electricity to consumers. MD – the MD value is the largest of the half-hourly demand (kW) values recorded by the metering system during a period typically 12 months. MD metered customers are allocated to one of four Classes on the basis of a ‘load factor’ calculation. The load factor (LF) measures the ‘peakiness’ of a customers annual demand shape. This value is equal to the customers actual annual consumption (kWh) divided by product of the MD value (kW) and the number of hours in a year (8,760 = 365 x 24), expressed as a percentage. A customer with a low load factor has a relatively peaky profile. Non-domestic MD with LF greater than 20% and less than or equal to 30%. Non-domestic MD with LF greater than 30% and less than or equal to 40%. Non-domestic MD with LF greater than 40%. Standard measure of generating plant capacity equal to one thousand kilowatts, or one million watts. Medium to large power stations have capacity typically in the range of 500 MW to 2,00 MW. A device for measuring Active Energy or Reactive energy. The meter advance is the difference in the meter consumption between two sequential meter readings. The data (as specified in the DTC) relating to the configuration of any metering equipment which is required to operate that equipment in an efficient manner. ‘Common Code’ is defined as a code which covers a large number of customers and can be covered by one or many supplies. If it is a PES specific code the MTC is unique to the PES and MTC 123 in EEB may not be the same as 123 in EMEB. b. Where a restricted hour/secondary meter exists. The MTC status code flag indicates if a MTC is New, Existing, Deleted, Updated since previous release or Warning – deleted at next release. The actual volume of electricity generated or consumed by a participant. It is the sum of the actual volume of electricity imported or exported at each BMU. Each metering system is allocated a unique identifier called Metering System Identifiers (MSIDs), and is made up of three components of the MPAN number Distribution Identifier, Unique Ref Number & Check Digit also know as MPAN Core No. Microgeneration is the generation of zero or low-carbon heat and power by individuals, small businesses and communities to meet their own needs. Microgeneration refers to a number of different sustainable or highly efficient fossil fuel technologies that can generate heat and/or electricity in the domestic and commercial sector. Some forms of micro power use fuels or energy sources that produce no greenhouse gases and are therefore, classed as renewable energy, thus helping to combat climate change. Wind turbines, micro-hydro systems, heat pumps and Micro-Combined Heat and Power [CHP] are just three of the many types of small scale generation technologies which can help to attain at least two of the energy policy objectives; reductions in CO2 emissions and reliability of supply. The purpose of monitoring and targeting (M&T) is to relate your energy consumption data to the weather, production figures or other measures in such a way that you get a better understanding of how energy is being used. In particular, it will identify if there are signs of avoidable waste or other opportunities to reduce consumption. Data collection may be manual, automated, or a mixture of the two. Once an M&T scheme has been set up, its routine operation should be neither time-consuming nor complex. An M&T scheme will provide essential underpinning for your energy management activities. (ii) maintain related technical information. Metering Point Administration Number: Unique National, 13 digit number Reference for a Metering System. The MPAN must be on all suppliers’ customers’ invoices. The MRA is the multi-party agreement that all Ofgem licensed Suppliers and Distribution Business enter into that governs the essential interactions between them when retail customers wish to change their supplier from one company to another. MRASCo is the "not for profit" company funded by MRA parties and established under the MRA that provides, either directly or through contracts, the secretariat services that are required to administer the MRA and undertake any development activities required by the UK retail electricity market. The meter reading issued for use as the initial meter reading for the New Supplier and the final meter reading for the Old Supplier on a change of supply. When attempting to register a new customer with a registration notice to takeover supply, the current supplier objects to Electricity Directs request for transfer. On the day commodity market. This market enables anonymously financially cleared on the day trading between market participants. Period of relatively low system demand. These periods often occur in daily, weekly, and seasonal patterns; these off-peak periods differ for each individual electric utility. Refers to the consumption of electricity produced by a generator on, or immediately adjacent to the physical site occupied by the generator without use of either a private network or the DNOs network. A contract that gives the purchaser the right, but not the obligation, to buy or sell the underlying commodity at a certain price (the exercise, or strike price) on or before an agreed date. An over-the-counter deal is a customised derivative contract usually arranged with an intermediary such as a major bank or the trading wing of an energy major, as opposed to a standardised derivative contract traded on an exchange. Swaps are the commonest form of OTC instruments. P272 requires that all maximum demand meters (Profile class 05-08) who have an AMR (Automatic Meter Reading) meter fitted will need to be settled on actual Half Hourly (HH) consumption data in the same way that Half Hourly meters (profile 00) are currently settled. Currently settlement occurs using an industry wide forecast that is pre-determined in order to allocate electricity volumes to each supplier. The organisation (Supplier, LDSO, Supplier Agent or SMRS) undertaking Entry Processes. Refers to power delivered during the period of peak system demand, usually working days from 7am to 7pm in the UK and excluding weekends and bank holidays. Due to the increase in demand, the power traded for availability at this time is ordinarily sold at a premium and tends to rely heavily on plant, which can be rapidly brought online, including coal and pumped storage facilities. The introduction of additional gas or electricity to cover this demand is known as peak shaving. Public Electricity Supplier – means a supplier which held or is a successor to a company which held a PES Supply Licence at the BSC effective date. There are 14 Public Electricity Suppliers, two in Scotland and 12 in England and Wales. Direct conversion of solar radiation into direct current electricity by the interaction of light with the electrons in a semiconductor device or cell. Generators and suppliers. Generally, physical market participants sell/buy energy forward and use spot and prompt (close to delivery) markets to fine tune their position. Price Average Reference (PAR) - the volume of electricity from the energy stack (taken in descending price order) included in the calculation of the Main Price. PAR is currently set to 500 MWh. The PAR volume is always the most expensive 500 MWh of available electricity in the main stack. Electricity distribution arrangements that are not owned by a DNO and that are exempt from having to have a distribution licence. Gas or electricity for delivery within the current calendar month. Gas includes Within Day, Day Ahead, Weekend and BOM contracts. Electricity includes the Day Ahead and Week Ahead contracts. Refers to trading for delivery between (but not including) within-day trading and the next month (front month). This includes a number of products, including for delivery in the following day (e.g. day-ahead), weekend, weekdays, and trades for the balance of week and balance of month. An option giving the buyer, or holder, the right, but not the obligation, to sell a futures contract at a specific price within a specific period of time in exchange for a one-off premium payment. It obligates the seller, or writer, of the option to buy the underlying futures contract at the designated price, should the option be exercised at that price. In an energy derivatives contract, the settlement price of the contract based on a particular location or particular blend of the commodity. Where market conditions support neither a rise or fall in prices, therefore they stay at a similar level. The product of voltage and current sand the sine of the phase angle between them, measured in units of voltamperes reactive and standard multiples thereof. 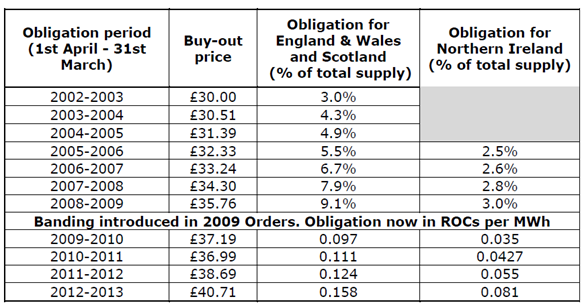 The method for distributing the buy-out payments collected from suppliers who did not meet their Renewables Obligation targets and re-distributing it, in proportion to their share of all the Rocs redeemed that year. Full load capability of a generating unit as declared by the generator, less the energy consumed through the unit transformer. Energy from sources which occur naturally and repeatedly in the environment, e.g. from the sun, the wind and the oceans, and from plants and the fall of water. The energy available from waste is also included in some applications. A certificate that specifies the origin of renewable energy. Used to demonstrate the pedigree of renewable power. Separate to Rocs, which are redeemed by suppliers. The Renewable Heat Incentive (the RHI) is a payment system in England, Scotland and Wales, for the generation of heat from renewable energy sources. Introduced on 28 November 2011, the RHI replaces the Low Carbon Building Programme, which closed in 2010. The RHI operates in a similar manner to the Feed-in Tariff system, and was introduced through the same legislation - the Energy Act 2008. In the first phase of the RHI cash payments are paid to owners who install renewable heat generation equipment in non-domestic buildings: Commercial RHI. The RO places a mandatory requirement on licensed UK electricity suppliers to source a specified and annually increasing proportion of electricity they supply to customers from eligible renewable sources or pay a penalty. The scheme is administered by Ofgem who issue Renewables Obligation Certificates (ROCs) to electricity generators in relation to the amount of eligible renewable electricity they generate. Generators sell their ROCs to suppliers or traders which allows them to receive a premium in addition to the wholesale electricity price. Suppliers present ROCs to Ofgem to demonstrate their compliance with the obligation. Where they do not present sufficient ROCs, suppliers have to pay a penalty known as the buy-out price. This is set at £40.71 per ROC for 2012/13 (linked to RPI). 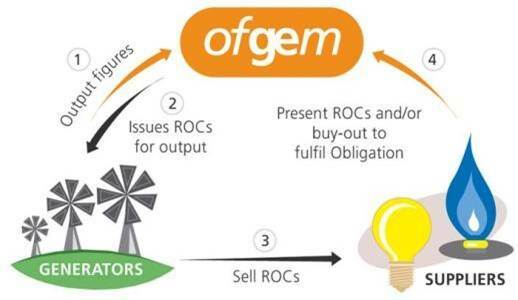 The money collected by Ofgem in the buy-out fund is recycled on a pro-rata basis to suppliers who presented ROCs. Suppliers that do not present ROCs pay into the buy-out fund at the buy-out price, but do not receive any portion of the recycled fund. The tradable certificates given to generators producing power from renewable energy sources. These certificates are used by suppliers to meet their Renewables Obligation commitment. Residual Cashflow Reallocation Cashflow (RCRC) is to cover balancing costs in the last 15 minutes before gate closure. The charge is for each half-hour, and may be positive or negative. For all Settlement Periods, the Total Residual Cashflow (TRC) is calculated as being the sum of all energy imbalance charges across all parties and accounts. This value represents the total amount of money to be redistributed (or collected) via the Residual Cashflow Reallocation Cashflow (RCRC). Each party will be allocated a Residual Cashflow Reallocation Proportion (RCRP) of the TRC for both of its accounts (Production and Consumption). AKA Beer Fund. There are two Energy Imbalance Prices, 'Main' and 'Reverse'. The Reverse Price is charged to parties out of balance in the opposite direction to the system. When the system is long, short parties pay the Reverse Price and vice versa. The Reverse Price is currently set to the Market Index Price. Control and limitation of the risks faced by an organization due to its exposure to changes, in financial market variables, such as foreign exchange and interest rates, equity and commodity prices, or counterparty creditworthiness. It may be necessary because of the financial impact of an adverse move in the market variable (market risk); because the organization is ill-prepared to respond to such a move (operational risk); because a counterparty defaults (credit risk); or because a specific contract is not enforceable (legal risk). Market risks are usually managed by hedging with financial instruments, although a form may also reduce risk by adjusting its business practices (see natural hedge). While financial derivatives lend themselves to this purpose, risk can also be reduced through judicious use of the underlying assets - for example, by diversifying portfolios. The TPR for the ‘Norma’ register also consists of a single clock interval (07:00 – 24:00) repeated for each day. Meters have circuits and registers that are controlled by a Teleswitch receiver device which operates according to switching instructions broadcast on a particular Teleswitch channel by the CentralTeleswitch Control Unit. These instructions govern the switching behaviour of circuits and the registers controlled by the Teleswitch receiver. The technique enables the relays and registers of similar metering systems to be programmed remotely to follow the same daily switching regime. The Teleswitch instruction is represent a set of TPRs, each comprising a number of Teleswitch intervals (similar to clock intervals), that define the switching times for a particular settlement register. An agreement between a power buyer and a power generator, under which the buyer supplies the fuel and receives an amount of power generated based on an assumed heat rate at an agreed cost. Arrangements for supply from other sources when the output of a local generator is either insufficient or if the generator is shut down. The amount of electricity required by a generator when they do not generate sufficient electricity to meet the demands of all the consumers they are contracted to supply. Messages traversing the Data Transfer Network, which relates to Messages sent by Users. The transfer of electricity at high voltage from generating stations across the UK through overhead lines and underground cables to points (GSP) from where it can distributed to users. The high voltage (HV) network that connects generating stations to the local distribution systems. In England and Wales this is owned by the National Grid Company, while in Scotland the transmission systems are owned by Scottish Power and Scottish and Southern Energy. Under the BSC arrangements Transmission Loss Multipliers (TLMs) are applied to BM Unit Metered Volumes as a means of scaling to account for losses on the Transmission System. The formulas for calculating Transmission Loss Multipliers are set out in BSC Section T, Paragraph 2.3.1. Historic Transmission Loss Multipliers data can be downloaded from the ELEXON Portal, as well as historic Estimated Transmission Loss Adjustment (ETLMOs), which are parameters set for the purposes of BMRS reporting. Transmission Network Use of System Charge (TNUoS). This covers the cost of using the National Transmission System, owned and operated by National Grid, to deliver electricity from power stations into and across the transmission network. Consumers of electricity are split into two categories: half-hourly metered (HH) and non-half-hourly metered (NHH). Customers whose peak demand is sufficiently high are obliged to have a HH meter, which, in effect, takes a meter reading every 30 minutes. The rates at which charges are levied on these customers' electricity suppliers therefore varies 17,520 times a (non-leap-) year. The TNUoS charges for a HH metered customer are based on their demand during three half hour periods of greatest demand between November and February, known as the Triad. Due to the nature of electricity demand in the UK, the three Triad periods always fall in the early evening, and must be separated by at least ten clear working days. The TNUoS charges for a HH customer are their average demand during the triad periods multiplied by the tariff for their zone. TNUoS charges levied on NHH metered customers are much simpler. A supplier is charged for the sum of their total consumption between 16:00 and 19:00 every day over a year, multiplied by the relevant tariff. TUoS charges are raised by the National Grid to Suppliers for their use of the national grid transmission network. These charges are normally passed on to the customer as part of the unit price shown on the bill. In the case of Supply Only Billing (SOBS) the TUoS charges are shown separately to the Supply charges and can change during the contract period as they are reviewed annually. The three half hour periods of the highest demand on the transmission system, with at least 10 days between them, from the beginning of November in one year to the end of February in the following year. IT software application used by electricity supply companies for the purpose of creating quotations to consumers for the supply of electricity. The measure of how the market value of a portfolio will decrease over a given period of time with a given probability The VaR of a portfolio is the worst loss expected to be suffered over a given period of time with a given probability. The time period is known as the holding period, and the probability is known as the confidence interval. VaR is not an estimate of the worst possible loss, but the largest likely loss. For example, a firm might estimate its VaR over 10 days to be £100 million, with a confidence interval of 95%. This would mean there is a 1 in 20 (5%) chance of a loss larger then £100 million in the next 10 days. In order to calculate VaR, a firm must model both the way the relevant market factors will change over the holding period and the way, if any, these changes are correlated between market factors. It must then evaluate the potential effects of these changes on its portfolio at the desired level of consolidation (by asset class, group or business line, for example). A variable margin payment that is made by clearing members to their respective clearing houses based upon adverse price movements of the futures contracts that these members hold. Where one supply group owns two or more parts of the energy supply chain. For example, where the same supply group owns generation capacity and also supplies energy to the retail market. Day Ahead and Weekend contracts. Relative change of prices from one time period to another, often in the short run; also used as a measure of risk, hence viewed as a negative in that it represents uncertainty. Weighted Average Cost of Gas/Weighted Average Cost of Electricity. The conventional unit which measures the rate of flow of energy. One watt amounts to one joule per second.